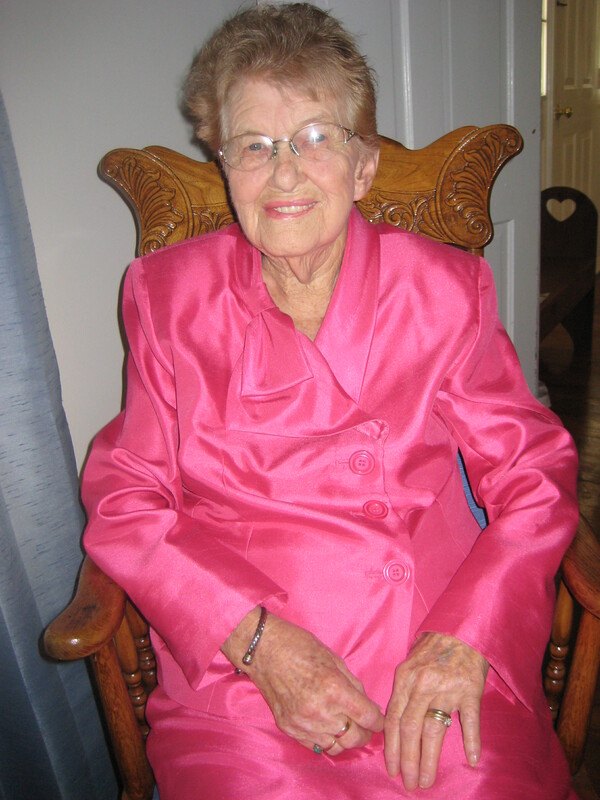 Hattie Lucille Bowyer was born October 4, 1913, the only daughter of the late Phillip McClellan and Betty Ann Whanger Bowyer of Sink Grove, West Virginia. Lucille’s early school days in the first grade were spent in the one-room school of Big Survey and the second grade through eighth at Sugar Stump. The grades nine through eleven were spent at Rocky Point Academy in Sinks Grove. As a graduate of Rocky Point Academy she gave a valedictory speech at Mt. Pleasant Presbyterian Church. 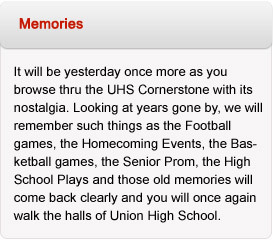 She then went on to graduate from Union High School in 1934. Although she qualified… she was not eligible to be valedictorian of her senior class because she had not attended Union High School for two years. Lucille married Thomas Elmer Lemons in 1938 and raised three children: Betty Pearl Lemons McGuire, a graduate of Union High School “Class of 1957” (deceased in 1960), Thomas “Tom” Elmer Lemons, Jr., a graduate of Union High School “Class of 1964”, and Doris Ann Lemons Taylor, (married to Fred L. Taylor II), a graduate of Union High School “Class of 1972”. Lucille is grandmother of four and great-grandmother of eight. Lucille has been a member of the Mt. Pleasant Presbyterian Church for 82 years and held many offices including being a member of the session, an elder, a deacon and has taught many Sunday School classes. She was awarded a life membership to the Mt. Pleasant Presbyterian Church in Sinks Grove. Lucille has been a member of the Eastern Star #122 for 76 years. In 1940, she became a charter member and president of the Sinks Grove Farm Women’s Club (now called CEOS). She has held all offices and one of her reports earned for her national honors. She has also served as leader of the Better Builders 4-H Club. She has served on the Selection Committee for the Eva Reynolds Lemons Music Memorial Scholarship Fund. Lucille has served on the Monroe County Republican Executive Committee and was named “Monroe County Republican of the Year” in 2006. Lucille has been a member of the Monroe County Community Service Board, Monroe Garden Club, Monroe County Historical Society, Friends of Second Creek, Monroe Outreach Ministry, AARP and Senior Citizens Services, and the list goes on and on….Lucille’s involvement in the community is second to none. Lucille spent twenty-five years working in her flower-vegetable garden selling plants and exhibiting canned goods, flowers and sewing at the West Virginia State Fair. She had always dreamed of becoming a beautician and for twenty years she cut and styled hair and gave perms for the ladies in the Sinks Grove area. 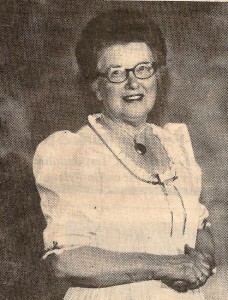 She later became a sales clerk at the Leggett’s Department Store and retired in 1978 after twenty-one years. In 1984, Lucille became the “Monroe County Belle” sponsored by the Monroe County Extension Homemakers Council. She was selected by seventeen clubs in the county as “A Representative of the True Pioneer Mountain Spirit” and in 2009, “The Monroe County Autumn Harvest Festival” was dedicated to Lucille Lemons. After her retirement… in her so-called spare time, she worked in her yard and garden and also helped her neighbors by taking them where ever they needed to go. She has given advice on how to save money, recycle and reuse, and organic gardening. She cuts out newspaper articles and cartoons and takes them to people that she thinks will enjoy reading them. She tells stories and jokes about the good ole days and recalls history to many people who have roots in the Sinks Grove area. Lucille has been so proud that she was able to keep her drivers license and was still driving at the age of ninety-seven. In October 2012, Lucille celebrated her ninety-ninth birthday. She still has a twinkle in her blue eyes and her famous smile and giggle. Lucille lives in the family historic home place in Sinks Grove where she has lived for 82 years. She attributes her long life to her faith in God and keeping busy.